Download the large version of this infographic. Photos: Lauren Nichols. Design: Neil McCoy. Hello, world! I’m a microbial ecologist working in Rob Dunn’s lab at NC State University, where I’m studying the bacteria and yeast that live in sourdough starters. 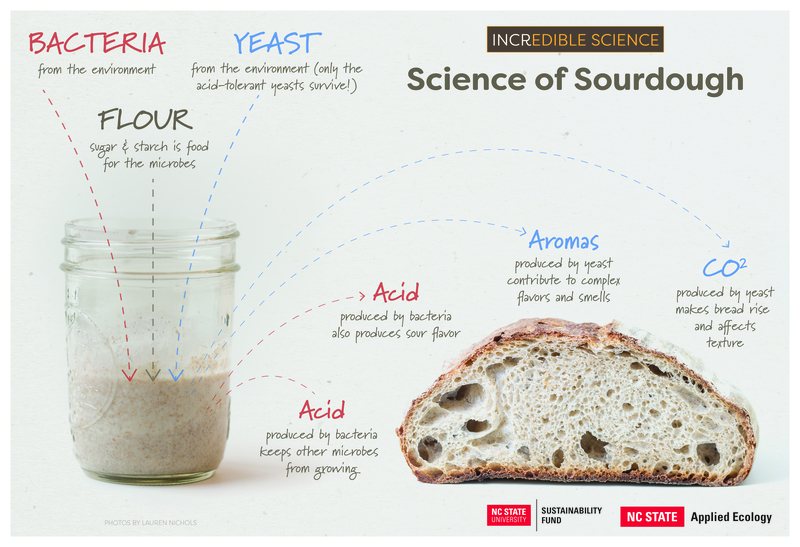 This spring I’m coordinating a scaled-down version of the Sourdough for Science lesson plan at Moore Square, Ligon, and Exploris middle schools in Raleigh. Over 200 students at these three schools will grow their own sourdough starters to compare the growth rate, gas formation, acidity, and smells associated with six different types of flour. The students’ measurements will help us to link concepts of microbial metabolism to bread characteristics. Students will watch introductory videos and read pop science text to learn about the processes and ingredients used in bread making. (You can see all of our materials in a shared Google folder online.) After completing background reading, the students will create, maintain, and measure their starters for 10 days. At the end of the two weeks, students will analyze their datasets and present their results. In addition to engaging students in authentic scientific research, we have partnered with Boulted Bread, a local bakery in Raleigh that is dedicated to producing artisanal breads and pastries from locally sourced grain that is milled into flour on site. Boulted Bread not only milled the flour that students will feed to their starters, but they have also agreed to bake bread from the 6 best starters grown at each school, for a taste test. During the taste test, students will evaluate the textures, flavors, and aromas of each bread, and relate these bread attributes back to their experimental results. I will be presenting the results of this project at the Asheville Bread Festival on April 13 in a workshop for educators or anyone else who wants to learn how to do sourdough citizen science. We also plan to publish the students’ data! In the meantime, I’ll write a few guest blog posts so you can follow our progress and results. Erin will purchase jars, markers, rulers, measuring spoons and distilled water. Boulted Bread will mill and bag flour in two-pound bags. February 1: Erin will drop off materials at each school. February 4–15: Students will grow starters and collect data. February 15: Erin will pick up supplies from each school to be cleaned and stored at the Museum. February 18–19: Boulted Bread will bake loaves for student taste tests. February 18–March 1: Students will analyze data and create presentation videos. March (TBD): Erin and Joshua will film a virtual tour of Boulted Bread. April 13: Erin will present results at the Asheville Bread Festival. We are using emmer, einkorn, Red Turkey wheat, rye, millet, and all-purpose flours. This combination will enable us to investigate how different grains and nutrients impact patterns of microbial growth and succession. All activities have been developed to support required curriculum standards (i.e. reading comprehension, math, chemistry, microbiology, and ecology). If you see additional alignment opportunities, please share your ideas! This project will span two school weeks. All starters will be refrigerated over the weekend to “pause” microbial growth. The “best” starters grown from each type of flour will be identified as those that grow the most, produce the most gas bubbles, and smell the most appealing.